“It’s a small world.” You hear it more times than not when you make a connection with someone you just met. With over 7.4 billion people on the planet, it would be easy to believe that you have no personal connections to the colleague you just met at a networking event or social gathering. According to the New York Times, the average person knows around 600 people—that’s a lot of names to remember, if you ask me! But, time-and-time again I find out that ‘Julie’ from the coffee shop went to high school with ‘John’ from the grocery store. Each time a connection like this is made, and dots are connected, my mind runs wild. “But how?” I ask myself. “How have these two individuals entered my life, while previously having connections with one another in the past?” Crazy, right! The best part about living in a small world is that these lines of association often become a benefit to you. Recently, I met with a woman who is thinking about making the move to Nashville from New York City. I was so excited to have coffee with her and share my knowledge and insights on the city I have called home for the past three years. But, take a few steps back, and think about how this connection was even made. She currently lives in New York City, I live in Nashville; I was raised in central Pennsylvania, she was raised in Knoxville, Tennessee. Well, let me tell you! Her father, Mark Schaefer and my boss, Anne Deeter Gallaher, met in 2009 via Twitter. The two of them grew a professional friendship, meet in real life at several social media events, and in 2011, Anne invited Mark to be a keynote speaker at an event she was hosting—Social Media at Work. I happened to be attending this event and had the great opportunity to sit down for dinner with Mark and Anne afterwards. Fast forward to a few weeks ago. Mark’s daughter was on a business trip to Nashville and asked her father if he had any contacts here that he could connect her with to sit down for a cup of coffee. Mark called Anne to retrieve my contact information and the new network was created! Friendships, business networks, family relationships—you name it, chances are there is a line of connection to anything you may be seeking. Every encounter you experience can have a lasting and positive impression. It might even hold the key to a new adventure or career change. More and more millennials are packing their cars and moving away from home to start a new beginning in a large city. This adventure offers many exciting avenues that can be taken, but when moving away from everything and everyone you know, it can be hard to achieve the goals you have set for yourself. I encourage all—young, old, transplants, or locals--to make it a goal to make a new friendship at the office, ask your gym-only buddy to go for coffee, and push yourself to attend those professional networking events that may not be at the top of your to-do list. 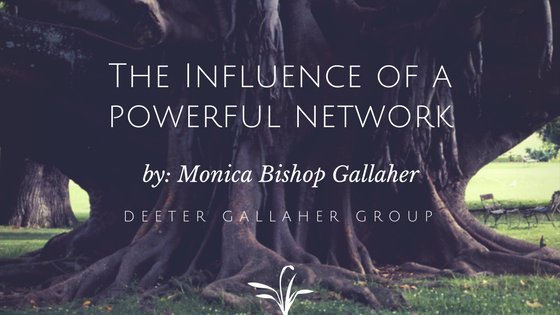 You never know how your network can have an influence on a new friend for years to come!